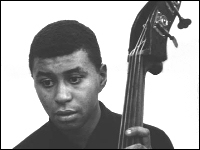 "Paul Chambers was a great genius of the bass. He was incredible, you know. Some of the things he did weren't really touched by anybody. Just things that he could do, nobody really knew what it was he was doing. He was fantastic." The role of the jazz bass player was largely a metronomic assignment until, in 1939, Jimmy Blanton's flight through time and space, when he alighted in the Duke Ellington airport, transformed the entire scene. Since that time scores of talented men have put hundreds of fingers to work proving that Blanton was right; that the bass is capable of melodic invention and rhythmic variety unknown before his day. Oscar Pettiford is the man generally assumed to have inherited the Blanton mantle, though Ray Brown, Red Mitchell, Percy Heath and a few more have exhibited formidable prowess and extraordinary heights of inspiration. And now, to join the handful of giants of whom one can speak in the same breath as these few, the inner jazz circle has welcomed Paul Chambers. Among other achievements Chambers can claim to be the first jazzman to earn dual reknown as an arco and pizzicato bass soloist. Born in Pittsburgh April 22, 1935, he entered music through a windy side entrance when he and several schoolmates were fingered to take up music and the baritone horn became his assignement. Later he took up the tuba. "I got along pretty well, but it's quite a job to carry it around in those long parades, and I didn't like the instrument that much." (Besides, you can't bow a tuba.) So Paul became a string bassist, around 1949 in Detroit, where he had been living for a while since the death of his mother. Playing his first gig at one of the little bars in the Hastings Street area, he was soon doing club jobs with Thad Jones, Barry Harris and others who have since effected the Detroit-New York junction. His formal bass training got going in earnest in 1952, when he began taking lessons with a bassist in the Detroit Symphony. Paul did some "classical" work himself, with a group called the Detroit String Band that was, in effect, a rehearsal symphony orchestra. Studying at Cass Tech. off and on from 1952 to '55 he played in Cass' own symphony, and in various other student groups, one of which had him blowing baritone sax. By the time he left for New York at the invitation of Paul Quinichette, he had absorbed a working knowledge of several armfuls of instruments. The Quinichette job was Paul's first time on the road. Since then he has worked with Benny Green's combo; at the Bohemia in New York with George Wallington's quintet; at the Embers and Birdland with Joe Roland; and on several jobs with the since-split trombone twins, J.J. Johnson and Kai Winding. For the past 18 months most of his working hours have been devoted to the furnishing of a solid understructure for Miles Davis, and it was with the help of two colleagues from Miles' combo ( John Coltrane and Philly Joe Jones ) that the present LP gained much of its power and conviction. Paul was about 15 when he started to listen to Bird and Bud, his forst jazz influences. Oscar Pettiford and Ray Brown, the first bassists he admired, were followed in his book by Percy Heath, Milt Hinton and Wendell Marshall for their rhythm section work, Charles Mingus and George Duvivier for their technical powers and for their efforts in broadening the scope of jazz bass. Blanton, of course, is his all-time favorite, the perennial poll winner in his ballot. Speaking of polls, a review of the last Downbeat critics' referendum shows that Paul won in the New Star bassist category by a comfortable margin with 85 points. It may not be long before Pittsburgh and Detroit start a fight about which city can claim Paul Chambers as a hometown boy. He's a valuable enough man on anyone's team to generate just such a squabble and these sides, I'm sure you'll agree, offer the most eloquent evidence to date. Whims Of Chambers, Blue Note. A selected discography of Paul Chambers albums. Chambers' Music, 1956, Jazz West. Whims Of Chambers, 1956, Blue Note. Paul Chambers Quintet, 1957, Blue Note. Bass On Top, 1957, Blue Note.